VJ Books Features Author Alan Jacobson! A Note from John about Alan Jacobson: "I recently read an advance copy of THE DARKNESS OF EVIL, the Karen Vail novel by Alan Jacobson. It tells the story of Roscoe Lee Marcks, one of history's most notorious serial killers, who sits in a maximum-security prison serving a life sentence - until he stages a brutal and well-executed escape. Although the US Marshals Service's fugitive task force enlists the help of FBI profiler Karen Vail to launch a no-holds-barred manhunt, the savvy and elusive Marcks has other plans - which include killing his own daughter. As the pressure builds to catch Marcks, Vail turns to the retired profiling legend responsible for Marcks's original capture, who may just hold the key to stopping him. John Sandford compares THE DARKNESS OF EVIL to THE GIRL WITH THE DRAGON TATTOO, calling it "smoothly written, intricately plotted," and "impressive," while fellow New York Times bestseller author Phillip Margolin says THE DARKNESS OF EVIL is "slick" and "full of very clever twists. Karen Vail is one tough heroine!" I continue to be impressed with Alan's tightly written, meticulously researched stories. His writing is tight and his plots deliver anticipation and suspense at every turn. Karen Vail is a complex, enduring character, with a supporting cast that is second to none". 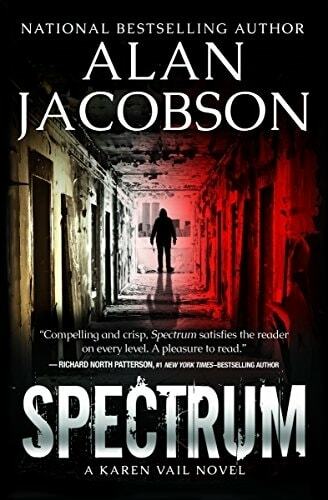 Jacobson is the National Bestselling Author of several critically acclaimed thrillers. Alan's two decades of research and training with the FBI's profiling unit, the Drug Enforcement Administration, the US Marshals Service, Scotland Yard, SWAT, and branches of the US military have helped shape the stories he tells and the characters that populate his novels. The San Francisco Chronicle stated that "Alan Jacobson researches his books like a good newspaper reporter, and then pushes the envelope into reality more thoroughly than the typical crime novel could ever allow." Alan's novels have made numerous "Top 10 Best Books of the Year" lists and five have been optioned by Hollywood. His main series character, FBI Profiler Karen Vail, was culled from several years of work with the FBI's Behavioral Analysis Unit and tracks unintentionally closely to the real female FBI profiler, with whom Alan has worked for more than fifteen years. Author Signed Hardcover Book. 2008 NY: Perseus Publishing First edition, first printing, mint, new/unread in a flawless dust jacket, signed by the author. Each dust jacket is protected in an acid-free archival quality acetate cover. First Edition Hardcover Book 2009 NY: Vanguard Press First edition, first printing, new/unread in flawless dust jacket. Each dust jacket is protected in an acid-free archival quality acetate cover. Author Signed Hardcover Book. September 2009 NY: Vanguard Press First edition, first printing, mint, new/unread in a flawless dust jacket, signed by the author. Each dust jacket is protected in an acid-free archival quality acetate cover. Limited Lettered Edition. June 2018 OR: Norwood Press Limited lettered edition, signed by Alan Jacobson, lettered A-Z, bound in 1/4 leather with marbled boards, housed in a custom slipcase. Limited Numbered Hardcover Book. June 2018 OR: Norwood Press Limited numbered edition, numbered, first printing, mint, new/unread in a flawless dust jacket, signed by the author. Limited Lettered Edition. March 2017 OR: Norwood Press Limited lettered edition, signed by Alan Jacobson, lettered A-Z, bound in 1/4 leather with marbled boards, housed in a custom slipcase. Limited Numbered Hardcover Book. March 2017 OR: Norwood Press Limited numbered edition, numbered, first printing, mint, new/unread in a flawless dust jacket, signed by the author. Limited Lettered Edition. July 2012 OR: Norwood Press Limited lettered edition, signed by Alan Jacobson, lettered A-Z, bound in 1/4 leather with marbled boards, housed in a custom slipcase. Limited Numbered Hardcover Book. July 2012 OR: Norwood Press Limited numbered edition, numbered, first printing, mint, new/unread in a flawless dust jacket, signed by the author. Limited to one of 500. Each dust jacket is protected in an acid-free archival quality acetate cover. Author Signed Hardcover Book. July 2012 OR: Norwood Press First edition, numbered, first printing, mint, new/unread in a flawless dust jacket, signed by the author. Each dust jacket is protected in an acid-free archival quality acetate cover. Limited Edition Hardcover Book. July 2011 OR: Norwood Press Limited Numbered Edition, hand signed by Alan Jacobson. Numbered editions are numbered 1-100, in custom slipcase. Author Signed Hardcover Book. July 2011 OR: Norwood Press First edition, first printing, mint, new/unread in a flawless dust jacket, signed by the author. Each dust jacket is protected in an acid-free archival quality acetate cover. Author Signed Hardcover Book. 2008-2010 NY: Vanguard Press The Karen Vail Trilogy Volume 1. by Alan Jacobson, first editions, first printings, mint, new/unread in flawless dust jackets, in a triple-wide foil-stamped slipcase, signed by the author. Each dust jacket is protected in an acid-free archival quality acetate cover. Limited Edition. Author Signed Hardcover Book. 2011-2014 NY: Norwood Press The Karen Vail Trilogy Volume 2. by Alan Jacobson, first editions, first printings, mint, new/unread in flawless dust jackets, in a triple-wide foil-stamped slipcase, signed by the author. Each dust jacket is protected in an acid-free archival quality acetate cover. Limited Edition. Limited Lettered Edition. 2015 OR: Norwood Press Limited lettered edition, signed by Alan Jacobson, lettered A-Z, bound in 1/4 leather with marbled boards, housed in a custom slipcase. Limited Numbered Hardcover Book. October 2015 OR: Norwood Press First edition, first printing, mint, new/unread in a flawless dust jacket, signed by the author. Limited to 500 copies. Each dust jacket is protected in an acid-free archival quality acetate cover. Limited Lettered Edition. September 2013 OR: Norwood Press Limited Lettered edition, first printing, mint, new/unread in 1/4 leather, marble boards and deluxe slipcase, signed and dedicated to the sponsor by the author. Limited to one of 26 copies. A Suspense Magazine "Best Book of 2013"! Author Signed and Numbered Hardcover Book. September 2013 OR: Norwood Press Limited numbered edition, first printing, mint, new/unread in a flawless dust jacket, signed and numbered by the author. Each dust jacket is protected in an acid-free archival quality acetate cover. Limited to one of 500 copies. A Suspense Magazine "Best Book of 2013"! Author Signed Hardcover Book 2013 NY: Norwood Press First edition, first printing, mint, new/unread in a flawless dust jacket, signed by the author. Kickstarter Edition. Each dust jacket is protected in an acid-free archival quality acetate cover. Limited Lettered Edition. August 2014 OR: Norwood Press Limited lettered edition, signed by Alan Jacobson, lettered A-Z, bound in 1/4 leather with marbled boards, housed in a custom slipcase. Limited Numbered Hardcover Book Dedicated to Sponsors. September 2014 OR: Norwood Press Limited numbered edition, numbered, first printing, mint, new/unread in a flawless dust jacket, signed by the author. Extremely limited edition with dedication page with names of Kickstarter sponsors. Limited Numbered Hardcover Book. August 2014 OR: Norwood Press Limited numbered edition, numbered, first printing, mint, new/unread in a flawless dust jacket, signed by the author. Limited to one of 500. Each dust jacket is protected in an acid-free archival quality acetate cover. Signed Advance Reading Copy. 2014 NY: Open Road Advance reading copy, mint, new/unread in flawless pictorial wraps, signed by the author. VJ Books Price $35.99 --> Why collect ADVANCE READING COPIES? Limited Numbered Hardcover Book. August 2014 OR: Norwood Press First edition, first printing, mint, new/unread in a flawless dust jacket, signed by the author. Each dust jacket is protected in an acid-free archival quality acetate cover. Signed Advance Reading Copy. October 2010 NY: Vanguard Press Advance reading copy, mint, new/unread in flawless pictorial wraps, signed by the author. Author Signed Hardcover Book. October 2010 NY: Vanguard Press First edition, first printing, mint, new/unread in a flawless dust jacket, signed by the author. Each dust jacket is protected in an acid-free archival quality acetate cover. Available September 2013. Medium, Large, or XL Adult T-Shirt with NO WAY OUT cover art on the back. Click Here to Listen to our interview with Alan Jacobson about "Dark Side of the Moon"
Click Here to Listen to Alan Jacobson Talk about "The Darkness of Evil"